(P1) How much money would it take to make you feel properly COMPENSATED for your work? I enjoy my job so much that, often, I feel like I’m GETTING AWAY WITH something by getting paid for it. Still, I like being valued for what I do, and I can imagine I would feel especially appreciated if someone wanted to give me $1 million a year. (P2) Sounds pretty ridiculous, doesn’t it — a million bucks for just a year of work? Well, I can assure you, I get by on far, far less. I’m down there with all the rest of the solid middle class. I earn enough to finance a comfortable life but still have frequent days when I need to JUGGLE accounts and cut back to keep the bills paid. If I had an annual million, though, I don’t think I’d have any worries, other than figuring out how to spend such an ocean of cash. (P3) Some people, though, look at $1 million as CHUMP CHANGE, a GRATUITY, an insult. Those people are corporate CEOs. (P4) Five years ago, the EXORBITANT incomes of the men (and they are almost all men) at the top of the business world became something of a scandal, and Congress enacted new laws to put a ceiling on those STRATOSPHERIC salaries. Apparently, those laws did not work, according to a survey of the 200 highest-paid CEOs done for the New York Times. It is true that some of the most OUTLANDISH compensation practices have been eliminated, but that has not kept the pay of these corporate bosses from reaching new heights. 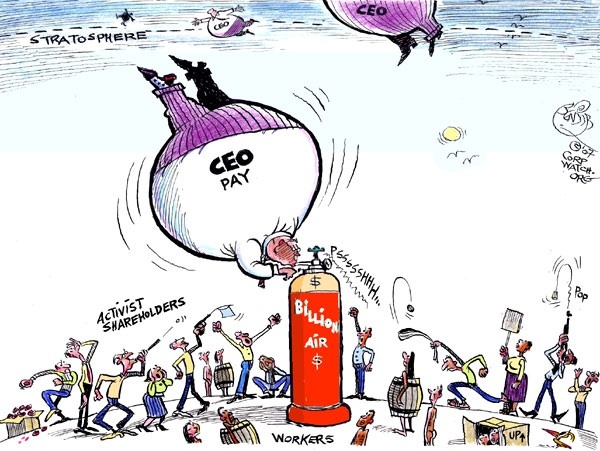 (P5) The average pay package for the top 200 chief executives is now $22.6 million, up by almost $2 million from last year. (P6) But $22 million is PALTRY compared with what the guys at the very top receive for their work. Those gentlemen are lucky enough to head some of the companies owned by billionaire cable and communications MAGNATE John C. Malone. According to the New York Times, David M. Zaslav, the person Malone hired to run Discovery Communications, brings home a PAY DEAL worth $156 million. Michael T. Fries, who runs Malone’s Liberty Global cable and wireless group, is rewarded for his work with a $112 million deal. Lump Zaslav and Fries together with two other CEOs in the Malone empire, and yearly compensation for just these four men hits $350 million. (P7) The list of chief executive officers RAKING IN tens of millions of dollars for 365 days of employment goes on and on. Yet, they look like middle management when compared with the top HEDGE FUND managers, whose yearly income can exceed $1 billion. (P8) Of course, the typical SCHLUB working way down the ranks in any of these big companies is being paid a tiny fraction of what the CEOs get paid. The justification for this is that, though a company obviously needs lots of people lending a hand to make the business thrive, success really depends on the genius and leadership of the men at the top. They are, allegedly, an elite bunch — superstars who deserve to be richer than kings. (P9) Sorry, but I don’t believe it. For every WIZARD OF INDUSTRY, such as Bill Gates or Steve Jobs, there are 100 CEOs who have merely CLAWED THEIR WAY TO THE TOP of an enterprise that would PUTTER along pretty well whether a particular individual were at the helm or not. I’d argue most CEOs are as interchangeable as managers at McDonald’s. (P10) Certainly, some are better than others, but they are not millions of dollars more worthy and more special than the talented people slaving away down the chain of command, earning static five-figure salaries and living with the threat of layoffs. (P11) The honest reason CEO incomes are so high is simple: Corporate CHIEFTAINS are a SELF-ADMIRING class of people who sit on one another’s BOARDS OF DIRECTORS and raise one another’s pay with little justification beyond their firm belief that they all deserve it. Are they embarrassed by grabbing such a big SLICE OF THE PIE while their employees struggle to get by? Not one tiny bit. They will happily accept more. Is the author of this piece, David Horsey, impressed by the talents of most CEOs? What do you think a good CEO should be paid? Writers like Mr. Horsey often describe Bill Gates and Steve Jobs as exceptions to the average CEO. What made those two men special? How much money would it take to make you happy?